Are you looking for a large executive bungalow (2800+ total sq ft) on the ultimate lot (twice the size of most) with tons of privacy and an oversize garage located on one of the best streets in the Canals? All freshened up and ready to go. A great floor plan with 10â€™ ceilings and skylight, make this property bright and welcoming. Perfect for entertaining or your family get-togethers. The kitchen, with S/S appliances, is perfectly set up for just you or lots of help. A walk through pantry straight out of the garage into the kitchen. Heavyduty aluminum shutters on the kitchen and living room windows. Separate dining room. Situated on a large corner lot (810 sq m) across the road from the canal and close to schools and pathways with room for a 40 ft RV/trailer plus 6 other vehicles on the driveway. Fully developed basement with a wet bar, an amazing large rec room, and 2 bedrooms. Enjoy your summers on the large private southwest deck with roll-up awning and the lovely treed landscaped yard. Home for sale at 119 Canoe Crescent Sw Airdrie, AB T4B 2N9. Description: The home at 119 Canoe Crescent Sw Airdrie, AB T4B 2N9 with the MLS Number C4225981 is currently listed at $450,000 and has been on the Airdrie market for 70 days. 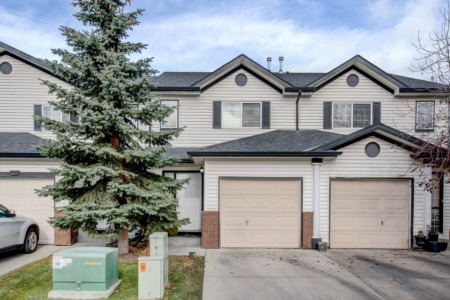 You are viewing the MLS property details of the home for sale at 119 Canoe Crescent Sw Airdrie, AB T4B 2N9, which includes 4 bedrooms, 2 bathrooms and has approximately 1503 sq.ft. of living area.